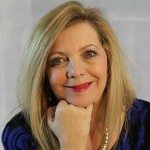 I am a huge fan of Murad products – and for me their Invisiblur Perfecting Shield is the best primer I have found to date, so I always look forward to trying new additions to their range. The Murad Age Reform Hydro-Glow Aqua Peel is a 2 step exfoliation and intense hydration system. The treatment comes in a giant sachet , separated into two parts. The first step is the exfoliation part of the process. You apply an over-sized pre-soaked swab that looks like a giant Q-tip all over your face. The swab contains a blend of lactic and glycolic acid and botanical extracts to gently exfoliate the skin. 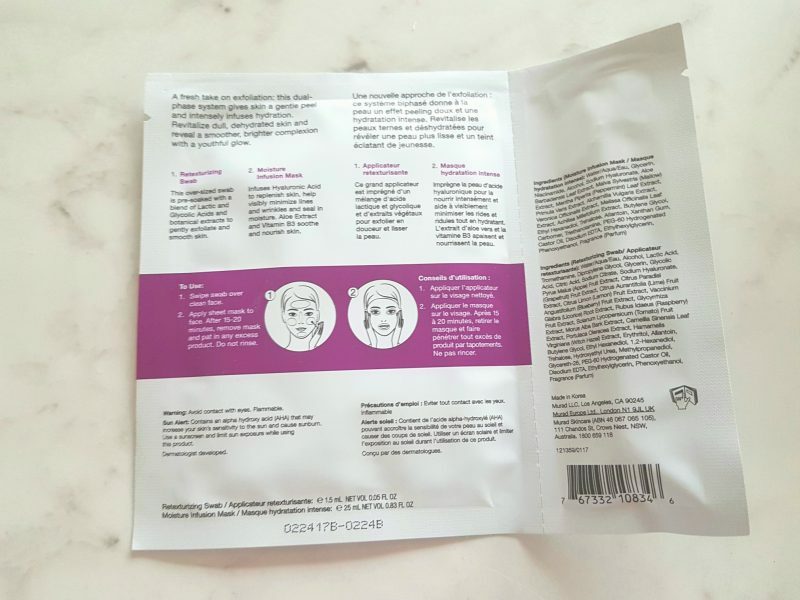 The second step is to apply the Moisture Infusion sheet mask for 15 – 20 minutes. 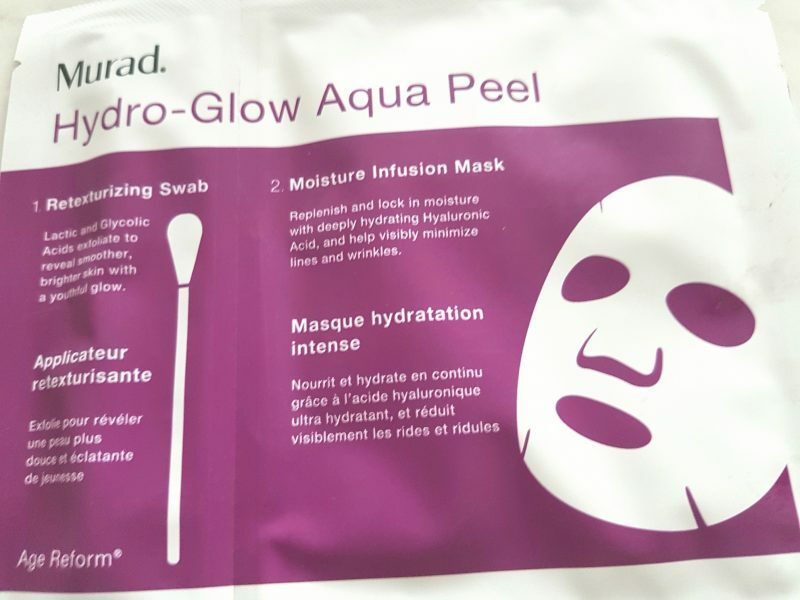 The mask feels incredibly soothing – and thankfully stayed in place without the product dripping everywhere – an issue I have found with other masks in the past. I’m not brave enough to take a pic of me with mask – only so much I will do for Fab after Fifty! The moisture mask infuses the skin with hyaluronic acid – to help boost moisture levels and minimise wrinkles. It also contains Aloe Extract and Vitamin B3. My skin felt incredibly smooth and plumped once I removed the mask. There was no redness – just glowing skin. I applied mine in the evening – the next morning my skin felt noticeably firmer, and my make up just glided on – I almost went without my trusted primer! Next time I will apply before getting ready for a special night out. I think this treatment can easily compete with costly salon treatments. Product Review: Murad Pore & Line Minimizing Hydrator with RepleniCell Hydration.